Bharat Heavy Electrical Limited i.e BHEL (A Govt. of India Enterprise) offers a challenging and rewarding career to Graduates for recruitment post of Engineer Trainees in the disciplines of Mechanical or Electrical Engineering through GATE 2017. 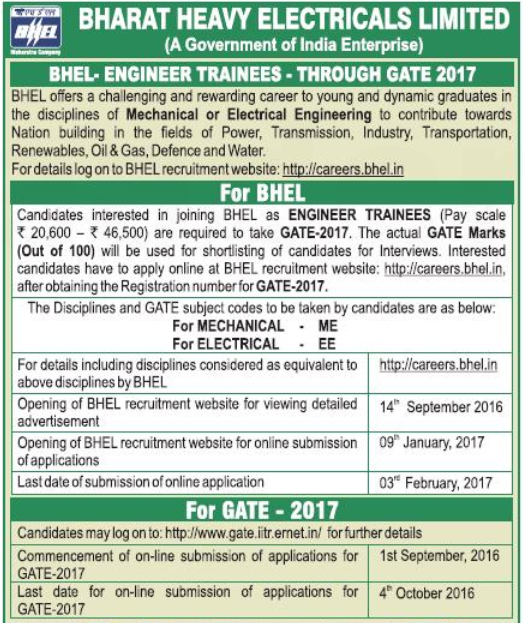 Eligible Engineering Graduates required to take GATE 2017 Examination in disciplines. The Online application start from 9th January 2017 and close on 3rd February 2017. 1. Engineer Trainees (ET) : 50 (Mechanical (ME) – 30, Electrical (EE) – 20) Posts. Full-Time Bachelor's Degree in Engineering/ Technology or Five year integrated Master's degree or Dual Degree programme in Engineering or Technology in the disciplines of Mechanical or Electrical Engineering from a recognized Indian University/ Institute. • 27 Years (Candidates born before 01/09/1989 are not eligible to apply). • 29 Years for candidates having two years' full time Post Graduate in Engineering or Business Administration/ Management. The selection based on GATE-2017 Scores. The actual GATE Marks (out of 100) will be used for shortlisting of candidates for Interview. The GATE 2017 Online registration close on 4th October 2016. • Last date for receipt of copy of Acknowledgement Slip at BHEL : 3rd March, 2017 (10th March, 2017 - for candidates in North East and far flung areas). Bharat Heavy Electricals Limited i.e BHEL, Power Sector Western Region, Nagpur invites applications from Medical Professionals for engagement of Part Time Medical Officer (PTMO) to meet requirement of its Office at Nagpur. The closing date for submission of applications is 15th October 2016. Bharat Heavy Electricals Limited owned by the Government of India, is an engineering and manufacturing company based in New Delhi, India. Established in 1964, BHEL is India's largest power plant equipment manufacturer. The shortlisted candidates will be called for Interview. Tentative date of Interview at Nagpur - 26th October 2016. Candidates have to send application form along with self-attested photocopies of required documents addressed to Manager (HR), Bharat Heavy Electricals Limited , Power Sector Western Region, 5th Floor Shree Mohini Complex, 345 Kingsway Nagpur-440001 , Maharashtra on or before 15/10/2016. The postal cover envelope super-scribed as "Application for PTMO".